Toasted rice cereal is mixed with melted chocolate and Country Crock® Spread to make a perfect base for fun Halloween decorating with the kids. Melt Country Crock® Spread in large nonstick skillet over medium heat. Add marshmallows; reduce heat to low and cook, stirring occasionally, until marshmallows are completely melted. Stir in chocolate and honey. Add cereal and stir until evenly coated. Press mixture into shallow baking pan. Refrigerate 10 minutes. Cut into bars. To make monsters, using whisk, combine confectioners sugar and lemon juice. Color some of the icing green adding a few drops of green food coloring and some black using black food coloring. (Add a few drops water if needed to create a spreadable consistency). 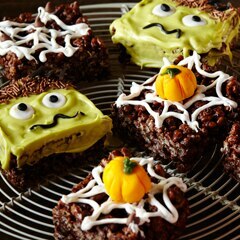 Spread bars with green icing. Sprinkle tops of bars with chocolate sprinkles for "hair". Add white chocolate chips for "eyes". Spoon black icing into small zip-top bag. Cut small piece off 1 corner and pipe "pupils" and "mouths" onto monsters. decorations such as pumpkins, spider’s webs and tombstones.